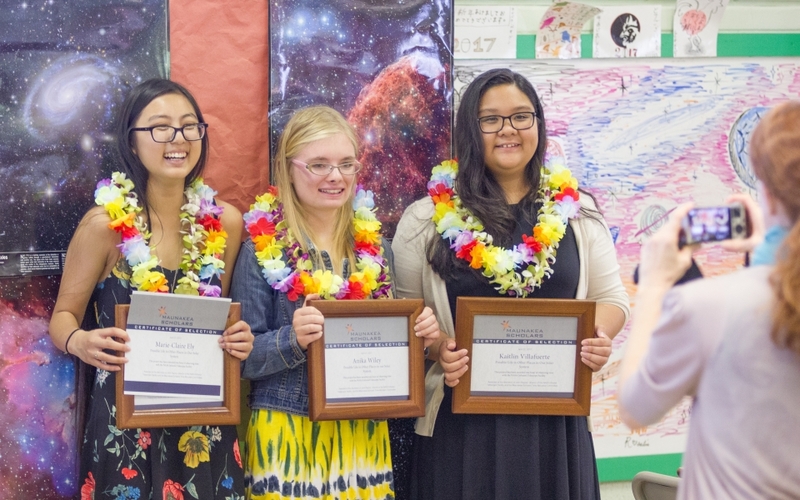 2017 Honokaa Maunakea Scholars Marie-Claire, Anika and Kaitlin. 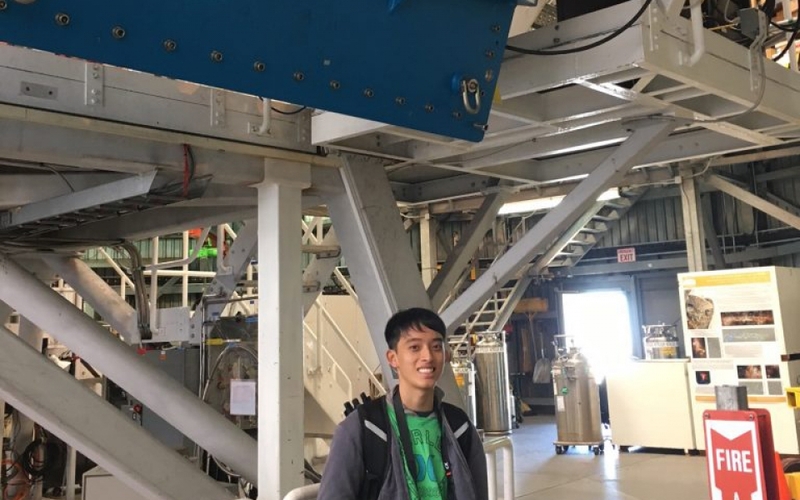 2017 Kalani Maunkea Scholar David poses with Espadons, the CFHT instrument he used to study the moon. 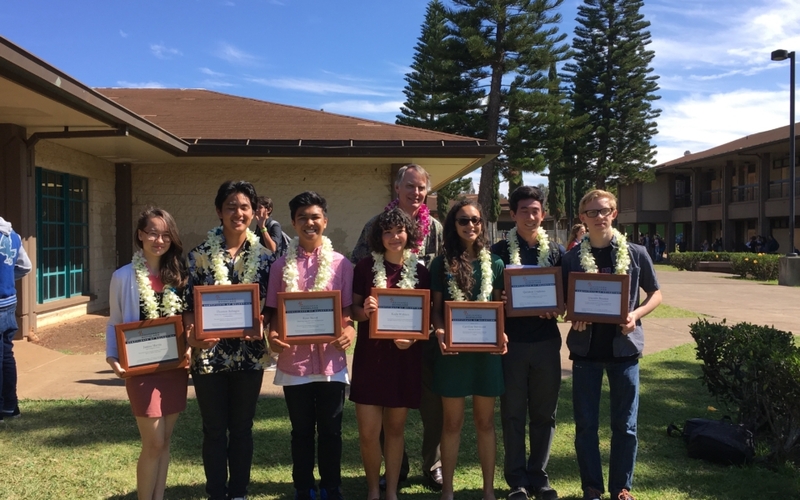 2017 Waiakea Maunakea Scholars Marc and Mason. 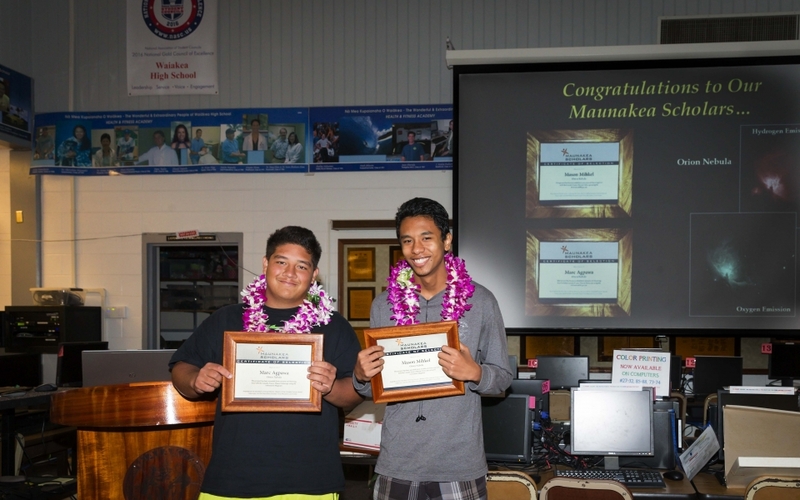 2017 Maunakea Scholars winners Ryland and Thomas upon learning their image will likely be in the 2018 CFHT calendar. 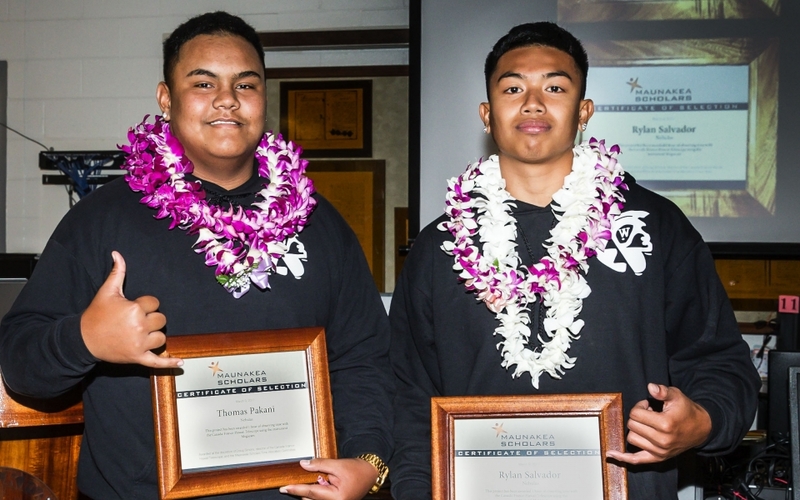 2017 Waiakea Maunakea Scholars Thomas and Rylan. 2017 Kalani Maunakea Scholar Spencer Young posing under the instrument that took his data, SCUBA2 at EAO. 2017 Nanakuli Maunakea Scholar Amber taking observations at CFHT. 2017 Maunakea Scholar Jordaynelexi Drasal observes her star cluster from the CFHT control room. 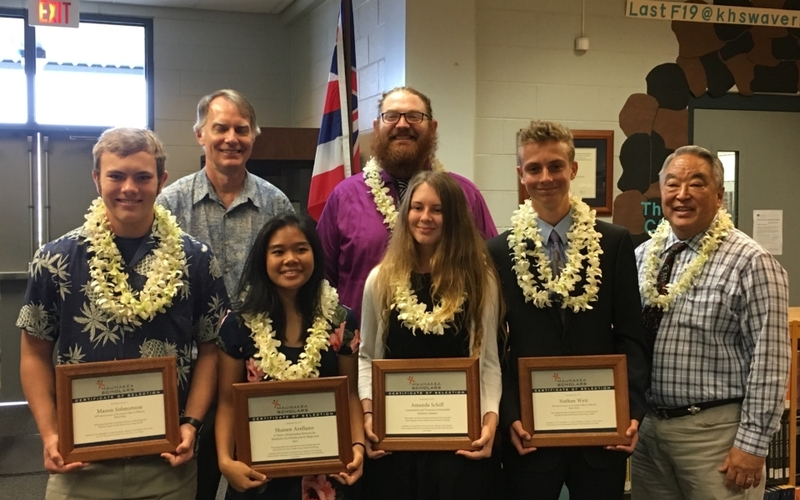 2018 Kealakehe HS winners (left to right) Mason, Shanen, Amanda, and Nathan. 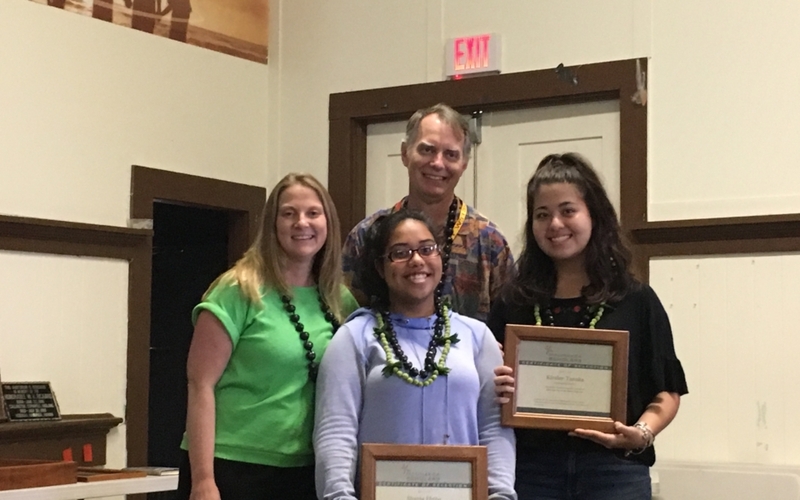 Shania and Kira, 2018 winners from Honokaa HS with CFHT's director Doug and outreach manager Mary Beth. 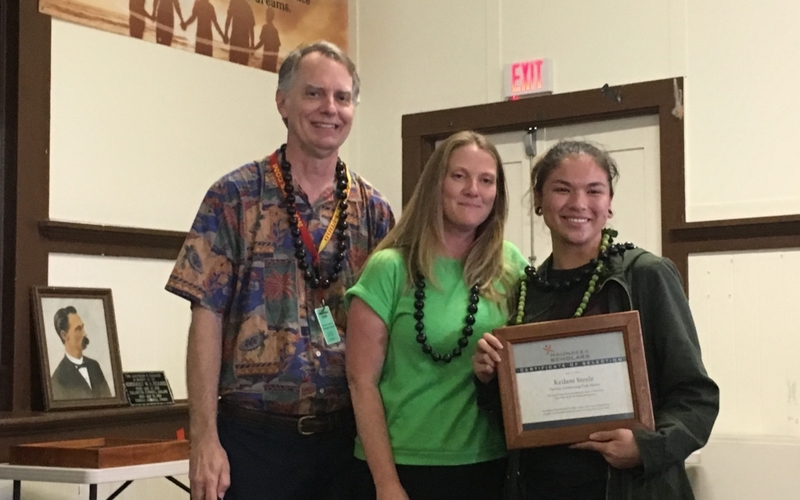 Keilani, another 2018 Honokaa HS winner with Doug and Mary Beth. 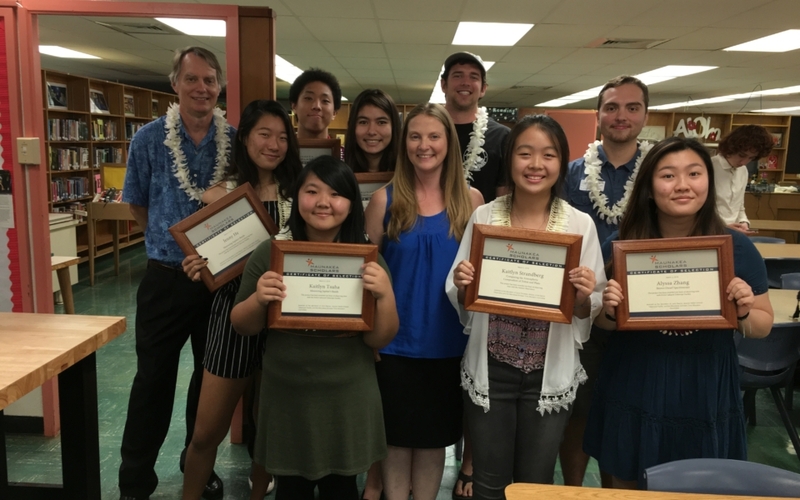 The 2018 Kalani High School selected Maunakea Scholars proposals (front l to r) Jenny, Kaitlyn, CFHT outreach manager Mary Beth, Kaitlyn, and Alyssa. Back (l to r) CFHT director Doug, Yuyun, Ashely, IFA grad student mentor Michael and IFA grad student mentor Ben. 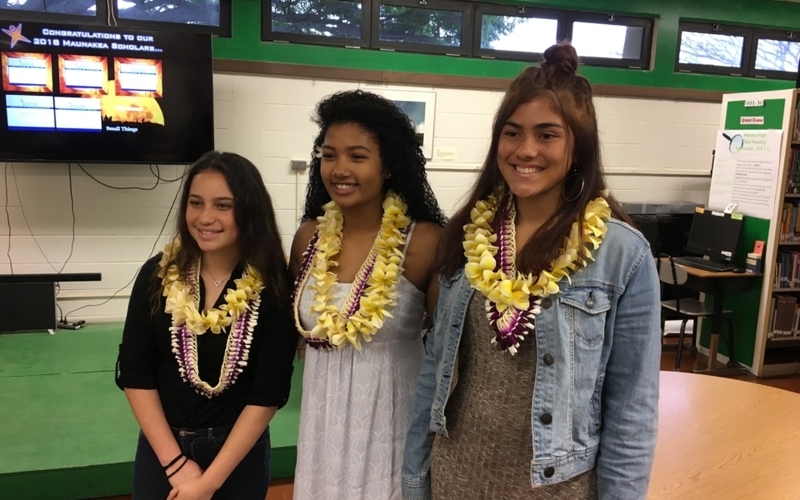 The 2018 Molokai High School students whose proposals were selected (l to r) Skylar, Sunni, and Taye. “NIR Spectroscopy of Accretion Disks of Different Black Holes” by Nathan Weir and Mason Solmonson, Nathan and Mason will use the Gemini North Observatory to observe a the accretion disk of a black hole. “Does the Metalicity of Nebula Affect their Shape?” by Shanen Arellano.Shanen will use SITELLE at the Canada-France-Hawaii Telescope to study the impact of a nebula’s metalicity on its overall shape. “Composition and Formation of Secluded Starburst Galaxies” by Amanda Schiff. 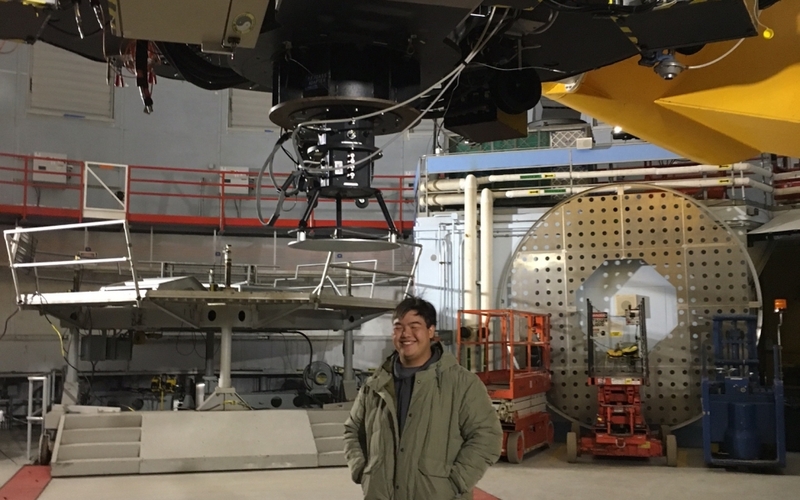 Amanda will use Megacam at the Canada-France-Hawaii Telescope to observe an unusual starburst galaxy, one that is not currently gravitationally interacting with others the normal trigger for starburst. “Measuring Jupiter’s Bands” by Kaitlyn Tsuha and Jenny He.Kaitlyn and Jenny will use NASA IRTF to observe the bands of Jupiter in the infrared. “Comparing the Atmospheric Composition of Triton vs Pluto” by Ashley Taylor and Kaitlyn Strandberg. Ashley and Kaitlyn will use the Gemini Observatory to look at the spectra of Titan and Pluto’s atmospheres and surfaces. “Determining the Composition of Asteroid in the Solar System” by Yuyun Lee. Yuyun will us the Las Cumbres Observatory to study the composition of asteroids. “Brown Dwarf Spectroscopy” by Alyssa Zhang. Alyssa will use the NASA IRTF to study the properties of brown dwarfs, the bridge between planets and stars. “New Life” by Tavita Vaitului. Tavita will use the NASA IRTF to study Saturn’s moon Enceladus as a possible location for life inside our solar system. “Does the orbit of Sagittarius A effect the Surrounding Stars?” by Elijah Kogler and Noah Kolona. Elijah and Noah will use NASA IRTF to study Sagittarius A, the black hole at the center of our galaxy and its impact on the surrounding stars. 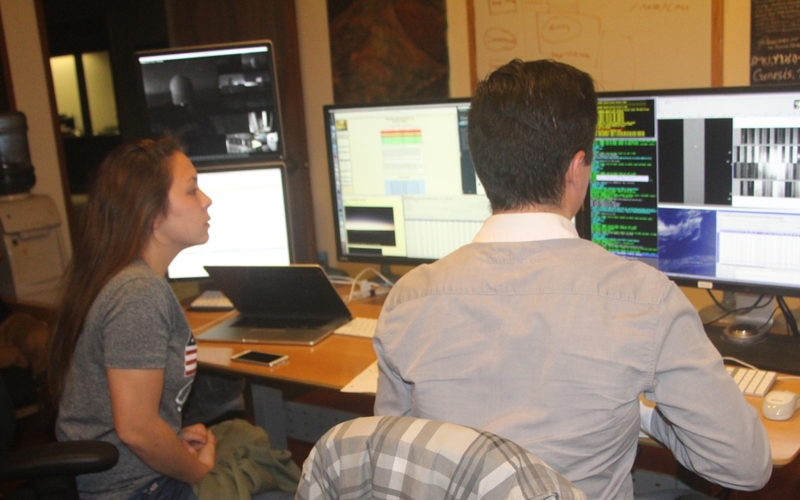 “Deep into the Storm” by Kayla Wohlers and Caroline Stevenson.Kayla and Caroline will use Espadons at the Canada-France-Hawaii Telescope and Robo-AO to study Neptune. “Observing Asteroid Colors to Determine Composition” by Ryan Siarot and Thorren Rebugio. Ryan and Thorren will use the Las Cumbres Observatory to compare the color of asteroids with known compositions to asteroids with unknown compositions to determine if asteroid color is a tracer of composition. “Dark Matter” by Quinton Uradomo. Quinton will use the FLOYDS spectrograph on Las Cumbres Observatory to create the rotation curve of a galaxy thereby measuring the indirect effects of dark matter. “Cepheid Magnitude Periods” by Janine Harris. Janine will use the Las Cumbres Observatory to determine the intrinsic brightness of Cepheid stars in Andromeda and their distance by measuring star magnitude periods. “Open Cluster HR Diagram” by Taye Mowat and Sunni Chow.Taye and Sunni will use the Canada-France-Hawaii Telescope to determine the age of an open star cluster. “The Life Cycle of Sirius” by Skylar Kuahuia. Skylar will use Espadons at the Canada-France-Hawaii Telescope to study the life cycle of Sirius, one of the brightest stars in the sky. “Supernova iPTF14hls- The Immortal Star” by Dustin Malasemal and Blane DeReis. Blane and Dustin will use the Las Cumbres Observatory to observe a supernova that defies expectations and keeps exploding. “How Does a Star Die” by Micah Yokomizo. Micah will use the Las Cumbres Observatory to compare the spectra of different types of stars to determine their ultimate fate. “Why do Medium stars collapse into white dwarfs and large stars Supernova” by Alena Soares. Alena will use the Las Cumbres Observatory to compare large and small stars to determine the differences between those that supernova and those that end up as white dwarfs. “Jupiter’s Red Spot” by Issac Pauole and Jacob Pauole. Issac and Jacob will use the NASA IRTF to study Jupiter’s Great Red Spot, a hurricane in the planet’s atmosphere. “Galaxy Colors” by Lana Nihipoli. Lana will use the Canada-France-Hawaii Telescope to study the different regions of a galaxy- star formation vs cooler older stellar populations. “Neptune” by Aminda Rechy. Aminda will use the Canada-France-Hawaii Telescope and Robo-AO to study Neptune. “The Key to Detecting Dark Matter” by Keilani Steele. Keilani will use the W.M. Keck Observatory to observe the Draco dwarf galaxy to map the galaxy’s rotation curve. 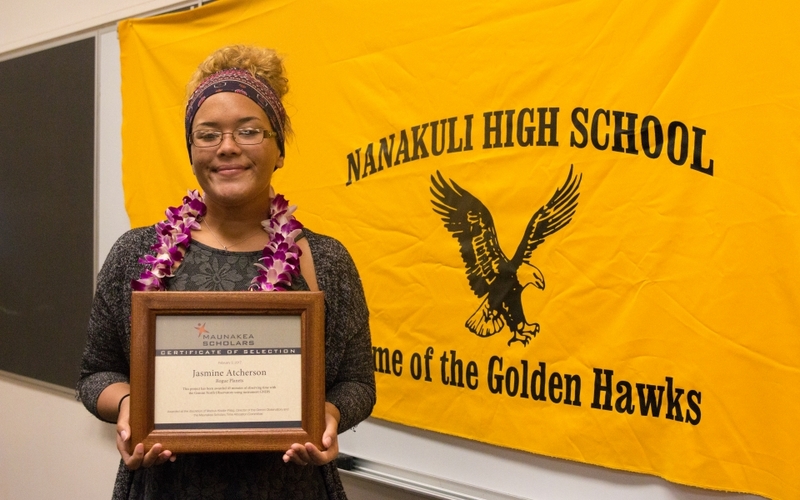 She is the first two time awardee of telescope time in the Maunakea Scholars program. 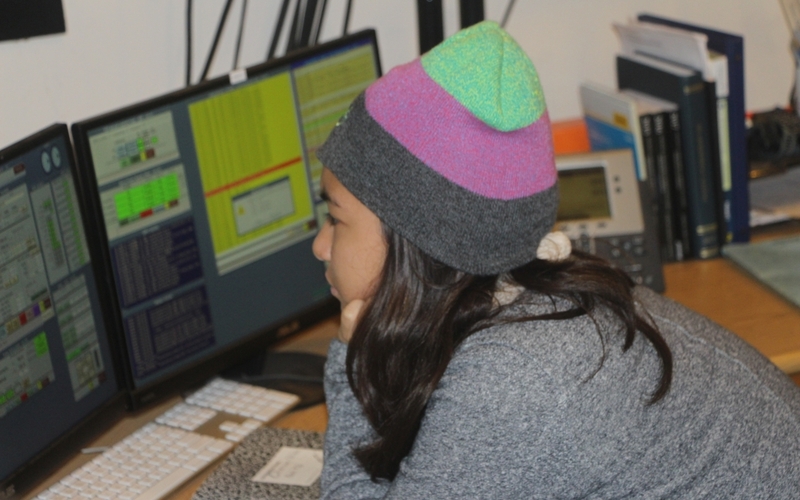 “Investigating Malin 1” by Shania Ebreo and Kiralee Tanaka.Shania and Kira used the Subaru Telescope to observe the largest known disk galaxy Malin 1 in late April. They want to study star formation in the galaxy. “Eclipsing X-Ray Binary System” by Amber Nakata, Nanakuli. Amber will use Espadons at CFHT to observe the binary at three points over the next 6-9 months. “Rogue Planets” by Jasmine Atcherson, Nanakuli. Jasmine received spectra from GNIRS at Gemini to observe an object that some astronomers classify as a brown dwarf, others as a rogue planet. “Spectroscopy of Hydrogen Rich Exoplanet Atmsopheres” by Chantelle Lopez, Kapolei. Chantelle is also using GNIRS at Gemini. She will observe an expoplanet and compare its spectra with a previous observation looking for changes or weather. “The Source of the Earth’s Water” by Emily Little, Kapolei. Emily used Espadons at CFHT to observe Comet 45P in February to look for the make-up of the comet, particularly the D/H ratio. 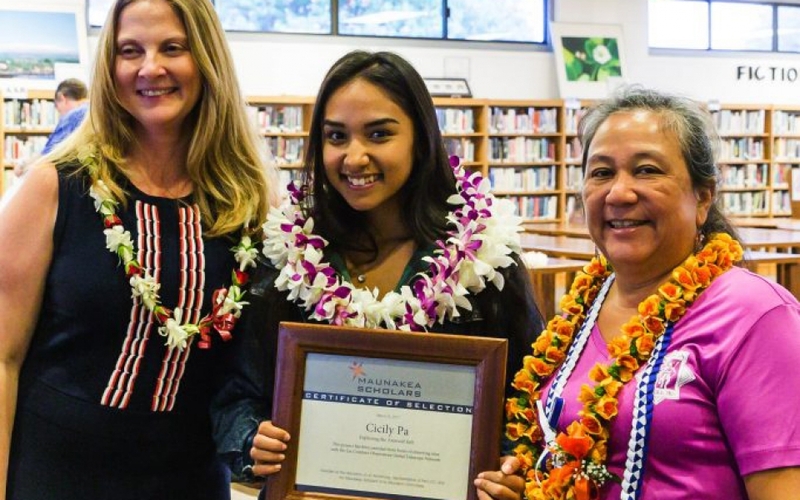 Emily plans to use her project to obtain a STEM diploma from Kapolei HS. “Comparing Elements in Different Supernova Remnants” by Ashlyn Takamiya and Justin Fernando, Kapolei. Ashlyn and Justin will use FOCAS at Subaru to compare the spectra of a Type Ia and Type II supernova remnants. “Globular Clusters” by Jordaynelexi Drasal, Kalani. Jordaynelexi used Megacam on CFHT to observe M92. She wants to use a color magnitude diagram to determine the age of the cluster. “The Creation of the Moon” by David Higashi, Kalani David used Espadons at CFHT to observe the surface of the moon. David selected both maria and highlands to compare the composition of the two regions. 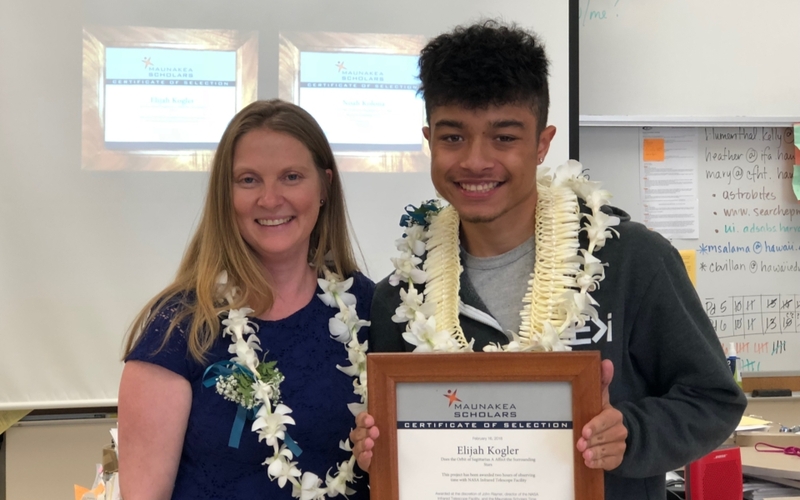 His program advanced to the Hawaii State Science Fair. “Star Forming Regions and how they retain their shapes” by Spencer Young, Kalani. Spencer used POL2 at the East Asian Observatory to measure the magnetic field of the Orion Nebula in an attempt to determine the origin of the nebula’s shape. A professional astronomer studying the same region used Spencer’s data and Spencer will be acknowledged in all her publications on the subject. Spencer also has access to her data. “Nebulas” by Thomas Pakani and Rylan Salvador, Waiakea. Thomas and Rylan will observe the nebula SH2 261. It will be one of the potential 2018 CFHT calendar images. “Exploring the Asteroid Belt” by Cicily Pa and Georgia Carter, Waiakea. Cicily and Georgia will us the Las Cumbres Observatory Global Telescope Network to observe an asteroid in an attempt to calculate its rotation rate. 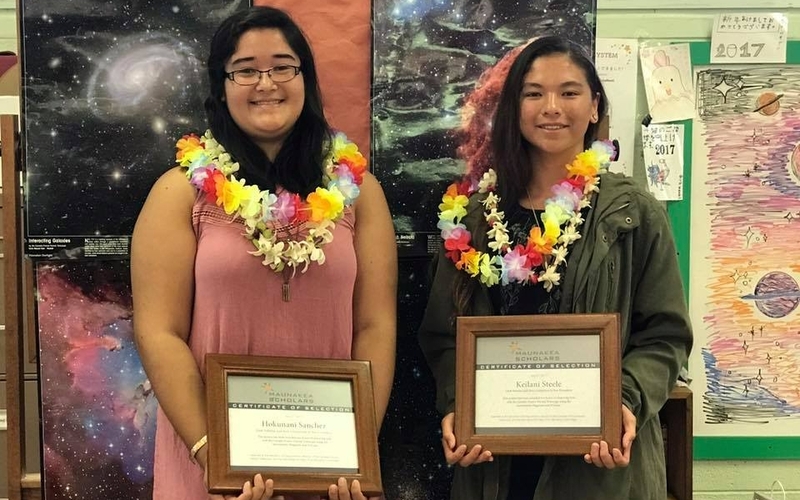 “Dark Nebulae and Their Connection to Star Formation” by Hokunani Sanchez and Keilani Steele, Honokaa. Hoku and Keilani will use Megacam and Wircam at CFHT to study the Great Rift Nebula in the center of the Milky Way. They hope to determine if there is a difference between the difference patches in the nebula. “Possible Life in Other Places in Our Solar System” by Annika Wiley, Marie-Claire Ely and Kaitlin Villafuerte, Honokaa. Annika, Marie-Claire and Kaitlin plan to use NASA’s IRTF to study the infrared spectra of Titan over the course of a few months. 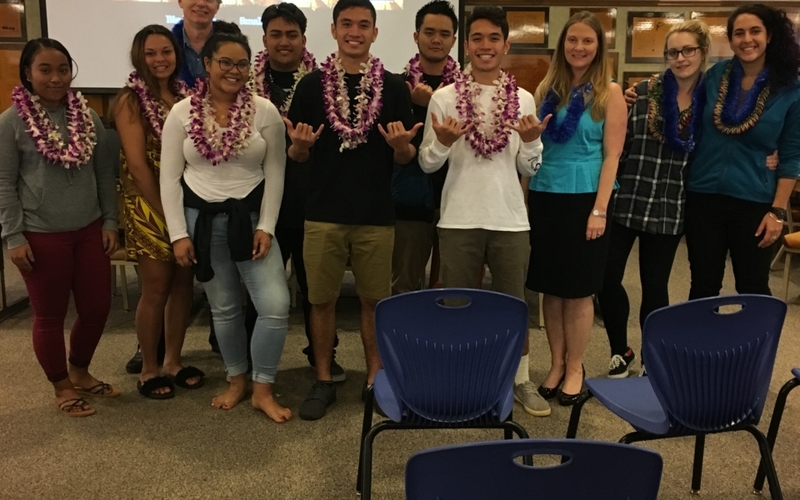 “Exploring star-formation in the hosts of radio quiet quasars” by Ana Bitter, Hannah Blue, Kylan Sakata and Ramsey Hayashi from Waiakea HS using Megacam at CFHT. 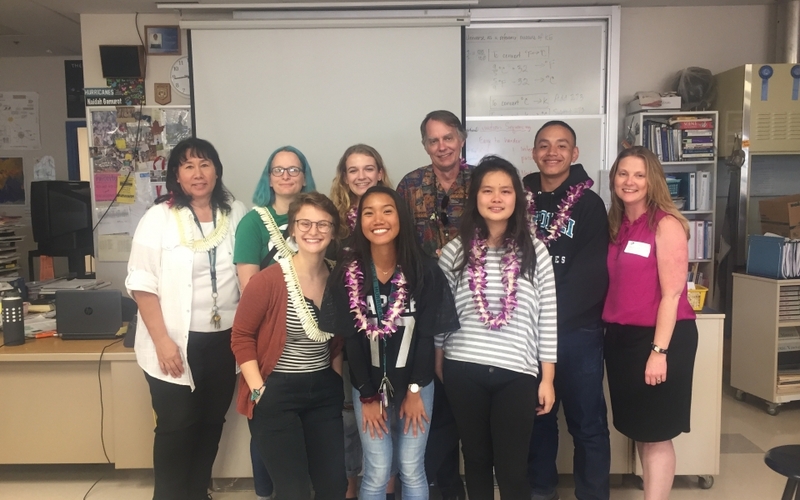 “Validating or Redefining Mischaracterized Unconfirmed Exoplanets” by Ashley Cobbs and Nevyn Tyau from Kapolei HS using Wircam at CFHT. 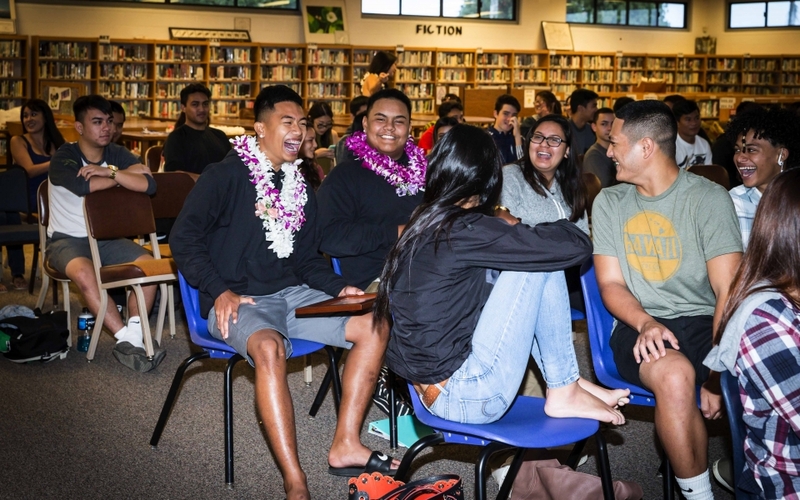 “Quasars and What They are Made Of” by Jamie Valdez and David Zerba from Kapolei HS using Espadons at CFHT.